For humans, getting our nails done by a professional is a luxury, but regular trims and cleaning are certainly a part of our hygiene routines! For our pets, it’s a little bit different. If you have a dog, cat, or even a bird or reptile, you need to include their nails in their care routine, and that may include taking them to a vet office more regularly. Luckily, it tends to be cheaper for our four-legged, winged, and scaly friends for this kind of trip. Our pets cannot trim their own nails and if they get overgrown your pet may experience discomfort or injury. Find out what each kind of pet needs for nail care below (and if there are any fun add-ons!). 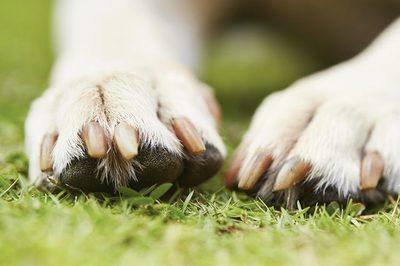 Dogs need their nails trimmed about every other week, but the goal is to keep their nails from touching the ground when they walk on a flat surface. Depending on the size of your dog and their feelings about nail trims, you might be able to care for their nails yourself. In fact, if your pooch enjoys a good spa day, you can even get dog-safe nail polishes! If you do your own dog’s nails, be prepared like the pros and keep styptic powder around just in case you ever nip the quick or if there is a little blood! If you’re uncomfortable keeping your dog’s nails in check NOVA Pets is here for you. Despite being domesticated, cats are able to care for their nails somewhat with scratching posts. They could still need a good nail trim every so often as well though. When cats scratch on posts they can release stress, spread their scent, and even remove old nail layers. But, a scratching post alone won’t keep those claws from becoming inconveniently long. While cats’ nails are smaller, and may be easier to trim than a dog’s, you also risk getting some good scratches on you if your feline is intolerant of having their paws touched. Some pet parents find that using an anxiety vest makes the process go much more smoothly. With that said, if your cat feels like getting their nails done is worse than getting wet, we encourage you to bring them in for regular trims where they could be sedated to ease the process along. Our professional and courteous staff will ensure your cat gets the care they need and that nobody gets hurt in the process. Sometimes other pets who aren’t so furry get overlooked when it comes to nail trims. That’s unfortunate, because when birds don’t get their nails trimmed it can be painful. In the wild birds’ nails are naturally maintained by the environment and a variety of perch textures in it. But the smooth, store-bought perches available to them in domestic environments don’t have the same effect, making it necessary for you to keep their nails from overgrowing. NOVA Pets is pleased to offer nail trims for them too! Finally, some reptiles need regular nail care as well. Usually the reptiles who need filing or trimming are larger lizards, or those who are particularly inactive. When reptiles dig and climb this generally keep their nails in check. Much like birds, reptiles require textural variety on their climbing surfaces for that to be the case. If you’re unsure about whether or not you need to trim your reptile’s nails, bring them in to NOVA Pets at your earliest convenience or at an upcoming checkup. You’re more than welcome to not only bring in your pet for nail trims but to learn how to do it yourself from us. We would be thrilled to teach you how to give your pet a proper nail trim in order to keep them safe and comfortable. The price of our trims is between $18-$40 depending on what kind of pet you have.